Come visit Italy and explore Maremma of Tuscany, a place famous as the region of horses. 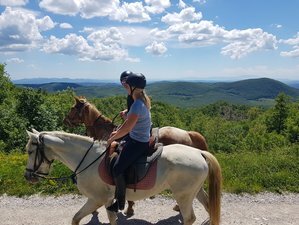 In this holiday, you will get sturdy and reliable horses as your riding partner so you can spend your days traversing the countryside and enjoy the beautiful natural sceneries of Tuscany with no worries. Moreover, if you are new to horse riding, you will also get the chance to learn the basic rules of riding a horse and improve your confidence for the whole holiday. Join and experience an exciting horse riding adventure like you never had before! On a large field with serene yet scenic meadows and woods around, Hotel Rifugio Prategiano stands tall. Maremma, located in Tuscany, Italy, offers you the most beautiful classic views over its stunning hills and valleys that you can enjoy. If that's not enough, you may try to visit the tranquil medieval town of Montieri with only a short seven-minute walk. Hotel Rifugio Prategiano is a small three-star hotel, but its terracotta statues, red marble stone walls, swimming pool with terracotta floor tiles, and porphyry stone-work that can give you a warm and rustic Tuscan agriturismo appeal. Upstairs, there is a spacious lounge with a wood-beam ceiling, fireplace, and windows that show a picturesque view of the mountains. Moreover, when you sit there, you may smell the delicious meals cooked directly from the nearby kitchen. The smell is so mouthwatering that you will keep wanting to wait by the kitchen door. In addition, below the hotel terrace, not only there are covered and uncovered car parking lots, but there is also a swimming pool, jacuzzi, and table tennis area. You can find Hotel Rifugio Prategiano's horse stables at about 300 meters from the hotel. There are 24 rooms, restaurant, bar, small meeting room, and large living area at Hotel Rifugio Prategiano. During your stay at the hotel, you will get complimentary internet points and big television facilities. The Wi-Fi has a fast connection and it is available almost in every corner of the hotel. When you go outside, you can find a garden that is not very big but can be the perfect place for a sundowner. Moreover, whenever it is sunny, you may have a marvelous view from Maremma to San Gimignano that is 55 kilometers away. The rooms here have Italian style decoration which is homely and comfy. The facilities are similar to a three-star or B&B hotel. Each room has a bathroom with shower, telephone, television, security safe, electric kettle, as well as fast Wi-Fi connection. You will find 14 rooms in the hotel's main building and 10 other rooms in the villa by the pool. If you bring a friend or children, you can add a bed or two in some large double or twin rooms in the hotel. Moreover, some of the smaller rooms have a beautiful panorama over the pool, trail riding center, and Maremma valleys. The main building's bathrooms are special as they are mostly tiled with antique Amalfi hand-painted tiles. A partial restoration has been undergone by Hotel Rifugio Prategiano to conserve these tiles. In addition, the bathrooms of the villa by the pool have also been refurbished recently. The outdoor swimming pool is open from mid-May to mid-September as these times are the months a hotter temperature of the year. The swimming pool sized 18 x 5 meters with sunbeds and umbrellas on the patio by the pool. You can enjoy a refreshing swim, relax, or sunbathe in this unique shaped outdoor swimming pool area. Hotel Rifugio Prategiano does constant filtering so the water will always be clear. However, as the hotel is situated in the middle of nature, you may find fallen leaves and pollen on the pool sometimes. When you do, don't let nature's touch discourage you from taking a fun dip in the swimming pool. The mini-pool or jacuzzi is open during the year's cooler months. The mini-pool will give you a welcome treat of a 37 degrees Celcius heated water. This spa will also give you a hydro massage that can relax your muscles with a deserving treatment after having many activities for the whole day. Furry guests are just as welcomed as human guests in Hotel Rifugio Prategiano. These furry guests will find the hotel's surrounding to be very friendly for them. If you do bring your four-legged friends, please don't forget to bring him / her blanket or bed as well. By "four-legged" friends, Hotel Rifugio Prategiano doesn't only mean dogs. You can also request to bring cats and other animals including your own horses. Hotel Rifugio Prategiano can accommodate private horses, sheep, goats, etc. in their stables' horse boxes. So, as you can see, any animals is (nearly) possible to come as part of you. However, please send an inquiry to Hotel Rifugio Prategio and inform them if you plan to bring your pet with you during your stay. Sitting on a horse for the first time will be an exciting experience. It can be something special as you will form a strong relationship to understand the amazing animals, horses. During this horse riding holiday, you will be guided by Hotel Rifugio Prategiano teams until you feel comfortable to experience your first step into the equestrian world. There will be basic rules of horse riding lessons after you completed a few hours of riding lessons. It is expected that the lessons will boost your self-confidence so that you'll be prepared for your first trail ride. By enjoying this trail ride, you will easily get used to knowing the quiet temperament of the horse. Please don't worry as the team has designed individually the outings and correct combination of the lessons. Also, you will discuss with your instructor what and how your next day lesson will be. Hotel Rifugio Prategiano welcomes those of you who already have experience in horse riding. During the trail ride, you will explore the most enchanting places in Tuscany, specifically Maremma. You will enjoy this trail ride for five days with a chance to enjoy the picnic lunches. While you're on the way to the crumbling farmhouse (the picnic location), you will go through the geothermal steam sites. The sites have green energy for 30% of people in Tuscany. The steam has vents that become Tuscany unique characteristic. After that, you will go back to the hotel and enjoy beautiful Travale on the bird's eye view on your way. You will follow a path through nature, go down into the neighboring valley, and ride up to the next mountainside. After that, there will be farmhouses and small rivers that you will have to pass. Then, you will go through Gerfalco small medieval streets. Afterward, you will arrive at a former silver mine where you will enjoy the picnic. This picnic place has a wonderful sea view and Maremma. This ride requires you to pass a mountain ridge through grassy fields. After that, you need to go down into Cecina River where there is running water through a shady forest that you have to follow. Then, you will arrive at the place where the picnic will be held. It is near the abandoned hotel and spa in Galleraie. There, you may go to the ruins of antique baths which is known in the Etruscans time. Afterward, you have to go through Travale where you can see the Butteri rides. This Prata ride offers the paths of the old trade and animal through the native forests. Wild animals such as fox, deer, wild boar, or porcupines in the area of Alta Maremma of Toscana can often be seen. While you're at "Poggio di Prata", you can see a 360-degree view of Tuscany such as the Maremma coastline and the island of Elba. The picnic will be full-course lunch near the mining village of Prata. The place is also visible from the poggio. You will enjoy the ride to the old mines of Boccheggiano. These places used to be worked for pyrite. There are number of mines that is not functioned anymore. However, this indicates the successfulness of the region of Maremma a long time ago and as a proof that times have changed due to the continuous out-migration of this industry. This Chiusdino ride will bring you from the wild Maremma of Toscana to the typical hilly agricultural view around Siena. You will ride around the medieval village of Chiusdino. There, the fantastic valley panorama of the Merse River will enchant your eyes. Merse River has overgrown fruit trees around the farmhouses. In this place, you will have a chance to be invited enjoying a fruit snack. however, this activity depends on a time of year. During this Merse River trail ride, you will pass the river crystal waters and enjoy how nature creates this agricultural land for over the years. You will have the picnic lunch on the riverbank. When the days are warm, you and your horses will be swimming - this is the high point of the riders' week. After that, you may have a chance to visit San Galgano's abbey ruins. This place has an antique and mystical atmosphere around the standing remains of this Romanesque chapel. This what makes the place one of the most interesting places in Tuscany. Hotel Rifugio Prategiano has 15 horses which consist of typical Maremma warmblood horses, Maremma cross-breeds, and other races. They are large, small, young, playful, patient, and quiet and has characteristics to survive in the earlier Maremma wilderness. This condition what makes the horses strong warmblooded races and ideal for trail rides. Today, the horses in many Italy regions stay on huge paddocks consisting of meadows and woods all year long. The horses at Hotel Rifugio Prategiano make friends and also has an organized hierarchy which becomes a mark the horses' life. Through the herd's supervision, they build characteristics such as strong and quiet which make them become experienced in difficult land conditions. This condition will allow you to be more relaxed while riding the horse without having serious injury whether in English ot trail saddles and on a loose rein. The horses that Hotel Rifugio Prategiano has are Nikita, Juliano, Shiva, Ramon, Oli, Pintora, Taiga, Hurricane, Alfio, Esmeralda, Gina, Top Gun, Narcisio, and Indiana. Caja studied translation and languages in Germany where she comes from. After university she came directly to Hotel Prategiano in Maremma Tuscany to be the main horse riding guide in 2017 after she had already done two summers as a trainee the two years before. She absolutely fell in love with the place and is now managing the stables. Andrea has grown up here at Hotel Prategiano in Maremma Tuscany and knows everything about the hotel and the region around it. He's an expert in horse riding, reception, maintainance, mountainbiking, marketing, etc. and is now one of the leading roles of the hotel. Hotel Rifugio Prategiano is located on a large building of meadows and woods which stand on 750 meters above sea-level on the slopes of the Poggio di Montieri. This hotel can be reached only a ten-minute walk from the medieval village, Montieri. At this hotel, you may enjoy a panoramic sight of magnificent landscape of Alta Maremma. In this place, a variety of animal and plant life can also be found including the thick native chestnut and oak forests, typical Tuscan olive groves, vineyards, pine and cypress trees, as well as the Mediterranean evergreens. Located in the vast middle and well-signed footpaths network, this place becomes a haven for horseback riders, mountain bikers, cyclists, or holiday walkers. There are also beautiful places in the area which can be reached on shorter walks. Moreover, the region around medieval Montieri does not only offer the beauty of nature but also historic and cultural places. One of the examples is that you may see many beautiful historical Tuscany landmarks which become ideal places for outings. In addition, Hotel Rifugio Prategian has is situated near amazing places - 95 kilometers from Florence, 65 kilometers from Volterra, 22 kilometers from Massa Marittima, 55 kilometers from San Gimignano, 50 kilometers from Castiglione della Pescaia, and 50 kilometers from Siena. Other interesting places are Etruscan excavation sites and ruins and a number of small medieval villages in the immediate vicinity which includes Chiusino (12 kilometers away) and Radicondoli (15 kilometers away). There is also a natural park which has deserted white sand beaches. This place is good for you who want to have a rest or relax after enjoying trips like visits to Roman churches, abbeys, noble estates, archeological sites, and museums.There is a "dog beach" which is located only a few kilometers from the hotel. This beach suits for your dog to swim in the small Merse River or just play in the sand. There is also another nearest pet-friendly sea beach. The place is situated in the south of Follonica in the direction of Castiglione della Pescaia in front of the Puntone harbor or known as "Kite Surf" beach. Please do not worry as from the hotel, there are miles of trails where your dog can run freely. However, this does not mean that you free your dog. There are some restrictions applied in the cities and villages such as keeping the dog on a leash and not allowing dogs enter most beaches in Italy during the summer months. Daily breakfast will be served each day. For the half-day trail rides, you will have a chance to join picnic lunches. The food at Hotel Rifugio Prategiano is Tuscan style and made from simple and traditional ingredients. The continental-style buffet breakfast will consist of coffee, bread, yogurt, cheese, meat, cereal, pastries, and more. Moreover, small snacks are available by request at the bar. There are two rooms at the hotel restaurant. One is a light room which has panoramic windows while another one is a rustic room. Here, the fantastic view over the pool, the equestrian center, and famous San Gimignano towers which are located 55 kilometers far can be seen. Take the exit of "Impruneta"
Take the exit "Follonica est"
Take the exit "Scarlino / Massa Marittima"
Please book your flight to arrive at Florence Airport (FLR), Pisa International Airport (PSA), G.B. Pastine International Airport (CIA), or Leonardo da Vinci–Fiumicino Airport (FCO). Florence Airport (FLR) is the closest international airport to Follonica with only 95 kilometers in distance. If you decided to fly there, then renting a car is recommended. You can arrive at the hotel from Florence Airport (FLR) with a two-hour drive. You can also book your flight to Pisa International Airport (PSA). It is further with 140 kilometers in distance, but it has more convenient flights. From Pisa, you can easily reach Follonica by either traveling on a train or rent a car and drive for two hours. Other options are Ciampino - G.B. Pastine International Airport (CIA) or Leonardo da Vinci–Fiumicino Airport (FCO) that are located not far from Rome. However, Rome is the furthest city compared to the other two. It is 250 kilometers away from Follonica, but you can also easily reach the hotel by traveling on a train or rent a car and drive for three hours. You can travel by train to Follonica from either Pisa or Rome. Hotel Rifugio Prategiano can pick you up there on request. Please send an inquiry for more information. Hotel Rifugio Prategiano in Maremma Tuscany offers mountain biking and horse riding holidays with fantastic views, a panoramic pool, and spa. This holiday is available from April 12 to October 31. Please select an arrival date below.